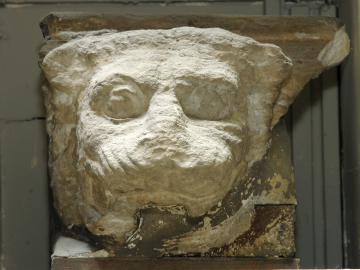 The head of a lion, the lower jaw broken away at the spout channel, protrudes from a section of the moulded architectural backing, it is finished with the edge above the lion's head forming an overhanging fillet. The style, workmanship, and size correspond with the lion's head spouts from the Nereid Monument in the British Museum1. The material Parian, or at any rate crystalline island marble, is the same, and the condition of the Soane fragment suggests that it too lay exposed to the elements for many centuries rather than enjoyed the protection of long immersion (as did the lion's head from the cornice of the Temple of Artemis at Ephesus2. Bearing in mind that the Soane example is in a poor state of preservation, too poor to judge details, there are two factors which caution against association of this fragment with the Lycian sculptures: the first is the relative frequence which such lion's head spouts occur in contemporary Greek architectural enrichment, and the second revolves around the fact that Sir Charles Fellows did not make his first visit to Xanthos until the Spring of 1838, one year after Soane's demise. The British naval expedition of January/February 1848, with which Fellows was associated, excavated the Lycian sculptures now in London and arranged for their transport to England. The presence of isolated and unexplained Greek-sculptures in the Soane collection comes as no surprise in the light of such marbles as the running female from the Erectheum Frieze (See below, Vermeule 278). 1 Smith, A.H., Catalogue of Sculpture in the department of Greek and Roman antiquities, British Museum, 3 vols, London, 1892-1904., II, nos. 938f., Photo IC (24). 2 Op.cit., no. 1234; II D (21).